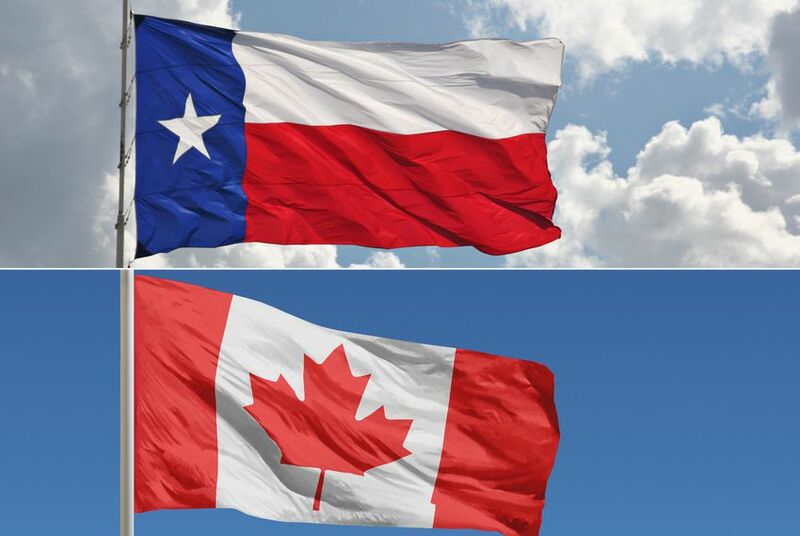 Texas sees more than $40 billion in total trade with Canada every year. Canada's potential exclusion from any new U.S. trade deal could result in the nation implementing costly tariffs that would hit Texas business, a trade expert says. As Canadian leaders scramble to persuade President Donald Trump to not exclude them from trade negotiations, a trade expert says that shunning America’s northern neighbor could hit Texans in the pocketbook more than they realize. Mexico continues to be Texas’ largest international trading partner after the North American Free Trade Agreement between the U.S., Canada and Mexico went into effect in 1994. Through the first half of this calendar year, $300 billion in two-way trade had passed between the two countries. The customs districts of Laredo and El Paso rank as the top two trading hubs, with $113.5 billion and $38.5 billion passing through the respective ports, according to U.S. census data analyzed by WorldCity, a company that tracks global trade patterns. But Canada has often been the country’s top overall trading partner, and Texas sees more than $40 billion in total trade with Canada every year. And the exclusion of Canada from any new trade deal could result in the nation implementing costly tariffs that would hit Texas business, said Doug McCullough, the director of the Canada-Texas Chamber of Commerce. “The president made the comment that this is one of biggest trade deals of all time, but it’s certainly not given the fact that, at the moment Canada, which is one of the United States’ largest trade partners – and Texas’ largest trade partner after Mexico” was left out, he said. Through June, Canada and China have each accounted for about 15 percent of the country’s trade at about $312 billion each. The top commodities Texas exports to Canada are crude petroleum, plastics and fuel, which account for more than $7 billion. “If NAFTA 2.0 excludes Canada, I would fully expect Canada to retaliate by imposing tariffs and other restrictions on imports from Texas,” McCullough said. He added that although Trump continues to slam NAFTA as a “bad deal” for America that’s led to trade deficits, that’s not the case if one factors in the billions in services that are exported annually. “The importance of the trade deficit is overblown because trade always balances. And more importantly, trade is really private businesses and consumers voluntarily engaging in exchange… not Canada, Mexico and the U.S. 'trading',” he said. McCullough said he’s encouraged that state leaders realize the importance of including Canada in the trade talks. After Trump’s announcement Monday on the tentative Mexico trade deal, Gov. Greg Abbott issued a short statement in which he expressed hope that Canada would be included in the dialogue. “Texas is the nation’s top exporting state, and with Mexico being our largest trading partner, this new deal should be good for the Texas economy. Canada is our second largest trade partner, and I remain hopeful that negotiations with Canada will be equally productive,” he said. During a conference call Wednesday with reporters, U.S. Sen. John Cornyn, R-Texas, said keeping Canada in international trade talks would sustain the job growth the country – and the state – have created. Though he also praised the development with Mexico, Cornyn said it’s only a matter of time before stakeholders and elected officials ask for more details about what the two countries hope to achieve with a new agreement. State Rep. Rafael Anchia, D-Dallas, said he won’t be convinced that Monday’s announcement will be a positive development if more details aren’t revealed soon. One of the details that did emerge was how the new deal with Mexico would affect the auto industry. To avoid tariffs, auto manufacturers would need to produce 75 percent of a vehicle's value in North America, an increase from the current 62.5 percent threshold. It’s something state Rep. César Blanco, D-El Paso, said needs to be looked at closely because motor vehicles and motor vehicle parts are among the top imports and exports between the two countries. On Tuesday, the Chicago Tribune reported Trump’s new deal with Mexico will mean an increase in new car prices and a greater demand for used vehicles.